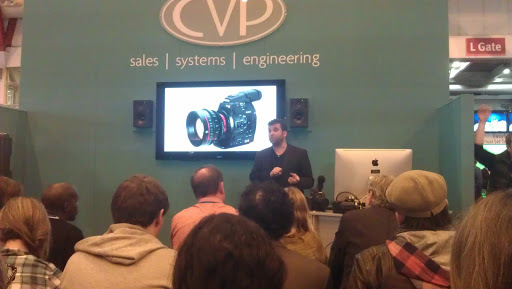 Today I went to the BVE show at Earls Court. I didn't go last year, but I did go in 2010. Like last time, The Production Show had it's own section and was full of lots of interesting exhibitors to do with filming. I didn't notice any new gear this time, but there was lots of Canon C300s mounted on various rigs and Sony had the new F65 on the CVP stand. The H Preston Media stand was absolutely rammed with people picking up bargains, so much so that I could barely squeeze past. I saw Phil from HDWarrior there playing with a C300 too. There was lot of interest in the Atomos Samurai... Quite a big queue on one stand to see the demonstration. After my positive results from the Ninja, I'd definitely look at the Samurai when I need HD-SDi input. The audio implementation looks fantastic too from the demo I watched. I picked up a very cool kit bag big enough to take my entire camera rig. It's huge, but pretty light and can also be used as a rucksack. That makes it sound small...but it's not...it would be a ridiculous rucksack, but it's nice to have the option. I also saw a really nice small jib on the H Preston Media stand... I don't need one right now, but will definitely get one before the next feature shoot.